The Crescent City Maulers, a hard driving band out of New Jersey have been exciting audiences for over 10 years combining rhythm+blues, jump, swing, and Vegas lounge. The band is credited for brining back the dance traditions of the 40's and 50's in the early 90's, and are featured on CD compilations with "The Brian Setzer Orchestra", "The Royal Crown Revue", and "Big Bad Voodoo Daddy". The Maulers gained national attention in 1996 with the release of their CD, "Screamin" and have appeared on USA NETWORKS "Up All Nite" with Gilbert Godfried. They also appeared on USA's tribute to Jim Carrey. The Maulers have performed and shared the stage with New Orleans legend "Dr. John", "The Dirty Dozen Brass Band", "The Cherry Poppin' Daddies", "Buckwheat Zydeco", "Sonny Landreth", and "Steve Riley and His Mallot Playboys". 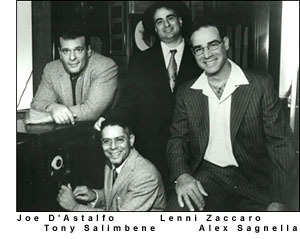 The band's core of "Big Al" Sagnella on guitar/vocals, Tony "Scams" Salimbene on sax, Len "Boom Boom" Zaccaro on drums has been the same for 10 years, with ex-Blues "Jumper Supreme" Joe D'Astalfo on the upright bass for the last 4 years. The Maulers latest CD "Dance, You Sinners" is available on Silk City Records. Book The Maulers for your next party or wedding by contacting "Big" Al at (973) 633-9600, or e-mail them at chriscams@earthlink.net. © 1993-2010 Crescent City Maulers, Inc.